When I think of the name of Janet Lee, what comes to my mind is her bright and beautiful face with a sweet smile. I used to watch her show on the MTV channel. I thought that she was a little older than me because of her mature and steady manner. Later, because of the interview, I collected her information, I realized that she is younger than me. A while ago before I had my mind to interview her, I saw Janet presented beauty and make-up products, washed her hair in front of the camera, and cooking via a live cam on her Facebook channel. I found that I had not heard her for a long time. Her quality is different from the past. I was curious to check her update, and I just knew the issues that had happened on her some years ago and the ins and outs. So I had the idea to interview her. In this interview, there is no dramatic title; you will not read any exaggerated mood text. The interview was purely for myself; I wanted to understand the woman who always sparkles in my mind, and I would like to know what makes her different now. Since childhood, Janet had looked for having a Western lifestyle. She began to listen to a lot of Western music since the third or fourth grades. It was a cassettes time. She grew up with melodies that she even didn't understand the meaning of the lyrics. "There is a sheet of lyrics in the tape. Before I started to learn English, I didn't understand the lyrics, but I followed the songs and sang along. I also watched music programs on time, as well as the most popular program, MTV channel." Listening to Janet saying this, I smiled; isn't that the American dream we all had in that era? Later, the form of music albums was evolved from a cassette to a CD. However, at that time, the development of Western music in Taiwan was not as good as today. Although we could find the albums of the popular singer's at the record stores; however, more albums that MTV introduced were not published in Taiwan. When Janet was eager to listen to the pop songs, she had to switch on the MTV channel on time and record her favorite songs. After entering high school ( the former school of National Taiwan College of Performing Arts), MTV channel was still accompanied by Janet's leisure time. In the last year of high school, MTV channel was preparing to enter the Taiwan market. Janet and her classmate participated in the select of local VJ trial. For Janet, it seemed that by participating in the VJ campaign, she could make a perfect mark for the past years for the fascination with Western music. From the preliminary round to the semi-finals, the process took a long time. However, because of the coincidence that Janet had to give up participating in the finals, she could only feel sorry. Janet felt confused before she graduated from the school: "I did not know what kind of job I could do. At that time, I even felt that I should go to KTV to work, and earn a generous hourly salary and then plan my future slowly." Janet talked pleasingly. If she did not mention it, I could not imagine that she was worried when she was a teenager. Unexpectedly, the VJ selection that Janet had missed turned back to her. "I received an official document issued by MTV channel and informed me that I officially became the MTV VJ. I really felt incredible that I could have this opportunity again after I missed it." At that time, Janet was not yet 18 years old, and she felt that she was closer to the MTV world. Is VJ a pedal to enter the entertainment industry? 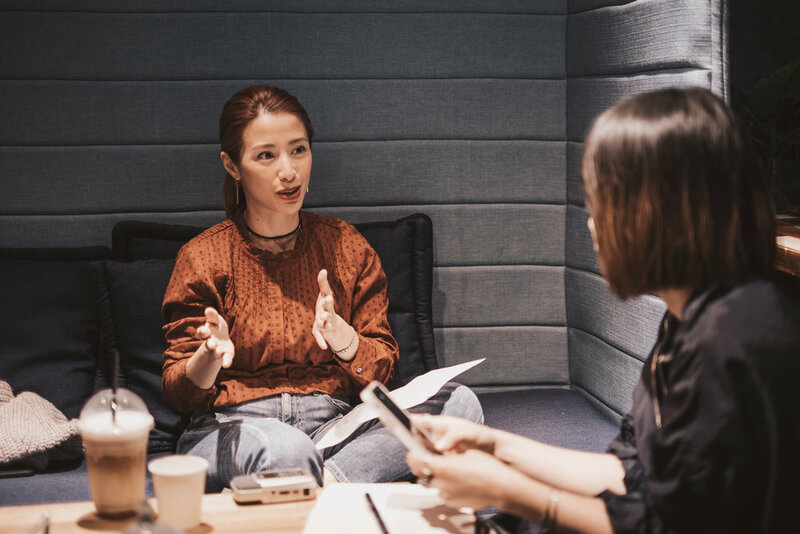 When Janet was ten years old, she met a talent scout on Zhongxiao East Road while shopping with her mother; then she became an model. The first performance was to join a toothpaste advertisement shooting. She showed her nice teeth in front of the camera, and the gesture of the ad reminded me of that time. Even with years of experience in front of the camera, Janet never felt that she was a public figure. 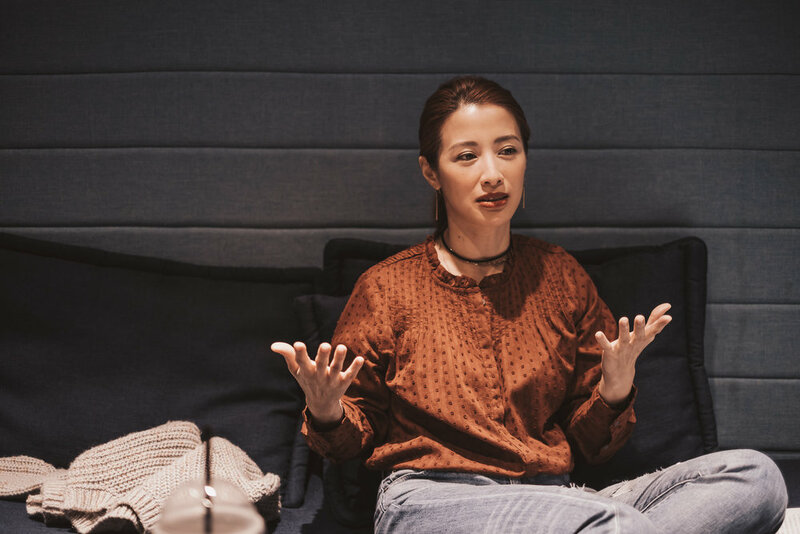 Even after joining the MTV channel to become a VJ, also, she had many opportunities to participate in international music awards and interview the well-known singers and bands; she felt that those superstars were far away from her. Those opportunities and her position seemed to be just an ordinary job. "Even if I took a lot of advertisements when I was young, I was just an model. I was not tall enough; therefore I shot mostly for magazines. I actually had no confidence in myself. Although I became a VJ, I didn’t want to be a star, it was purely for a dream of my young age. So I did not think that I would have the possibility to develop in the entertainment industry. For me, it was a different world." Janet said that at that time, she was in contact with all superstars every day, but she was inferior and felt that she was just a host who started the shows. Therefore, she was not active at work; all great chances were only duties for her. "Now thinking of it, I was too young and ignorant. I felt angry and arrogant. I didn't have the enthusiasm for my work and couldn't enjoy the process of life. I just wanted to finish my work quickly and go home." Janet said that she did not know how to fall in love with herself. It was a pity that she did not cherish everything. She recalled afterward that when she entered the entertainment industry, her mind was not mature enough. Under the glamorous appearance, it was actually empty. However, she was aggressive, and she did not like to lose; therefore she had always hidden behind her taugh disguise. "At that time, many female presenters had already worked on their own. I looked at myself, I was just another pretty face, and I had no chance to express my personality and thoughts." After the contract with MTV channel was over, Janet entered the entertainment industry as a host, and she felt inferior. Under the entanglement of inferiority complex and her disguise, the impression of "Janet Lee" slowly accumulated in the mind of the audience. "I gave birth to my first child when I was 26 years old. I felt that I was forced to be mature prematurely. Therefore I was reluctant and unwilling. What happened was not in my plan." From the age of 17 to 22, Janet worked at the MTV channel and later entered the entertainment industry until she was 26 years old. In the four years working in the entertainment industry, she had many opportunities to try different tasks, filming, hosting shows and advertisings. For Janet, she wanted to take all the possibilities, but after the unexpected pregnancy, all the work had to be terminated, and life had changed suddenly. "My mind was contradictory. When I held my baby in my arms, I certainly felt joy and sweetness. But when I thought that my friends still enjoyed their single happy life, I felt that I was bound by the family and the responsibility of being a mother. I was not prepared to take on all of this." From pregnancy to the birth of two babies, the three years was depressing for Janet. However, she did not like to show her weak side to others. Even when she felt depressed after childbirth, she tries to suppress the low mood. After many years, her two children have grown up, and both her life and family are running regularly. Janet is glad that she is still young and energetic, and has plenty of time and energy to develop her work and life. "I often encourage my friends. There must be some difficulties and pains in life. But we must first think about the future. If I could treat the childcare time with a different attitude at the beginning, I believe that all things would become different." When Janet talked about it, her eyes showed tenderness and sympathy. Now she has the courage to tell her deficiencies, know how to release her emotions, no longer to disguise herself to cater to the expectations or standards of the public. She finds the balance of life; this is the most important reason why she has a different temperament from the past. In the past, "Love yourself" was a slogan for women. Now women's sense of independence has improved a lot; but for many women, including Janet herself, have distorted this concept. "It is better to say that we (women) should choose to live in a different attitude. Going back to before is impossible. When you are married, you feel bored with your partner and ordinary life; you feel that your children limit your growth. On the other side, single people complain about loneliness. But we all forget that this is all about our choices. We should understand what results will be before we make decisions. I didn’t realize this point and only complained." Janet was not satisfied with life, and she filled the emptiness with material desires. She spent her income only on luxurious consumption. Every day, she wanted to enjoy gourmet or star-rated restaurants, and if she found popular holiday locations, she planned to travel with her friends. "Later, I found out that no matter what I did, I still felt empty and unsatisfied after I got home. Because there will always be endless food, more fun places, and new clothing and accessories; there will never be an end." She used to think about making herself happy. Now, Janet chooses to live in the present and cherishes her daily life. The former lifestyle she had was not loving herself. The most reason that why Janet improved her attitude was that she no longer cares about how others judge her. After changing her thoughts, her sense of security has enhanced. And this sense of security comes from herself, not through the material or relying on others. "When I understood this truth, I realized that my current lifestyle is the best way to love myself. I started to share my income to pay the expenses for my family. I feel very comfortable to carry an eco-friendly reusable bag and not worry about not to get the newest bags from high-end brands. Traveling with friends is still very good, but not only to show off. Sometimes I can be happy if I think about travel plans. So whether you are single or have a family, no matter you are rich or short of money, set your mind in the present and look forward to the future; I think this is how we can love ourselves." Nowadays, because of the promotion of media and advertisements, the society has created that women should love themselves by satisfying material desires, and make women have unlimited envy of illusory, glamorous life. At the same time, society has too many expectations and demands on us: enough saving in the bank; comparing yourself to those influencers on the social media, and even to compare the child’s growth and development. It is hard to get rid of the secular standard, but we can still live in a relaxed life by focusing on our standards and ourselves. Backtracking to the beginning, after having her religion, Janet put everything down and try to run her life. "In the past, many things can't be changed. The stillness in the past three years has allowed me to adjust my mentality and attitude. There are also many changes that I can not describe in words. At that time I felt that there was no tomorrow and I often wanted to give up. But the faith has given me a lot of help and strength." After the case, a lady contacted Janet and led her into the world of religion. For Janet, it seemed to catch driftwood in the sea, so that she could hold on and to breathe. "In the first meeting, Mr. Kuo-lun Huang (a musician basic in Taiwan) was also there. When he sang a few beautiful melodies that I had never heard before, I felt free, and it made me cry. I felt that I could finally put down my guise, repressed emotion and inferior feelings. I felt incomparably relaxed." When Janet described the experience of being exposed to the new religion, her look was first serious, followed by bright and happy freedom. Religion may be a medium for us to look at things from different points. Janet has been released from the process of constantly reviewing herself, rediscovering herself and believing in herself. Falling is not a failure; once you stand up, you have a chance to start. I noticed that Janet’s new update was because she was selling beauty and cosmetic products on her Facebook page. From her previous best-selling beauty books to the recent "101 days of beautiful Tips", how did she start running her career with beauty? Since she was a child, she has loved Western music, so she went to bookstores to buy international magazines. She collected different editions and designs and learned new English vocabularies from them. She also got inspiration for fashion and beauty. She used the scrapbooking to keep the content of her favorite magazines, which inspired her to edit beauty books later. "Actually, my private beauty care routine is simple. But at that time there were not many people writing beauty books, so we had good sales. Everyone affirmed my effort on beauty, and it was also the reason others called me a beauty guru. The title gave me a sense of mission." After the case in 2015, Janet withdrew from the public for a long time and lost all job opportunities. Later, she thought about how to start something again. "At that time, there was no way to get any cooperation or job. But in recent years, the influence of social media has become more and more important; I thought, perhaps it is an opportunity for me. Everyone affirmed my effort on beauty, so I started to share 101 days of beautiful tips on my own channel. The products I introduced had no commercial partnership, and are good things that I use continuously in my daily life. In addition to introducing my experience, I also brought in my special little stories. I did not expect to receive such good feedback from my readers. Later, I have opportunities slowly to return to the public." Coming back to the public, Janet has a different quality and image; readers and fans in the social media have also noticed and given positive feedback and encouragement. Gradually, brands are willing to cooperate with her. Her online beauty store is also in operation. It was hard to start a new beginning, and Janet is especially cherished. She works hard, respects every cooperated partner. Her attitude not only gradually wins favor from other brands, but also makes fans support her. "I no longer set myself as an artist or a star. In the past, those images had tied me. Now I am forty years old and come to another stage of my life. I don't want to repeat what I did when I was 20 or 30 years old. I cherish all opportunities and have my feet on the ground. Although I don't have great ambitions, I hope to brew my current career slowly. I hope that I can live with my true character and attitude which will allow me to go longer." When Janet was still young, she married and gave birth to two boys. Now, she enjoys the relationship with her family. Her two boys are active and energetic; however, because of following the belief with Janet, the two boys are easy and positive. "Children will, of course, have some childish behaviors or ideas, but as long as the reasons are understandable, I let them develop freely and accompany them to grow up. I am glad that my changes have also influenced the children.” Janet, who is now working hard with her media channel, often shares her experience with the children. The two sons also discuss their thoughts and observations with Janet. It is indeed a great way to make parents and children get a better understanding and interaction with each other. From my teen-hood, I had watched Janet shined since she worked as a VJ. Her sunny, bright style and fluent English always had put me to shame. I always thought that she had a beautiful life; in fact, she had no self-confidence and always tried to pretend to be strong. "The past life experience actually has a great impact on us. Even if we think it's okay, it always affects us all the time. Now I learn to look at myself and face the past without hurting or blaming. Take a good consider at yourself to get real freedom." The Interview took more than two hours. Janet bluntly shared her ups and downs. She answered all my questions sincerely. I had to leave for the next meeting; otherwise, we would definitely talk longer. I told Janet that I have always admired her, and I was so excited to meet her for the interview. She laughed and said that I looked calm, which was not showing exciting. Yes, I was excited and inspired. I still feel that it was an excellent opportunity to meet her in person. We all said, "Don't be afraid of failure. If you fall and then stand up again, it will be fine." It is actually too rash. Because others do not easily understand the pain, it is hard to imagine about the hurt and embarrassment. Janet appreciated what had happened three years ago and then had the opportunity to improve her life. For me, she is as beautiful as the lovely young VJ at the time. But now, she has a sense of charm that she has learned and developed from her life which represents her efforts and sincere.